Outside of a few specific food items, I considered myself pretty adventurous food wise. While my parents did expose me to many different things outside of our French-Canadian customs, it wasn’t until I moved downtown for school did I learn to enjoy some more “obscure” (at least from my perspective) food cultures – proper Indian cuisine, great Ramen, true Mexican eats etc. Now, my adventures have not made me an expert in these fields yet but I continue to enjoy these experiences enough to keep them up and staying adventurous. All of this came to mind when I heard about a new restaurant in St-Henri – rapidly becoming one of my favourite neighbourhood and possible future living spot – seeking to be a true falafel shop and serving up great Middle Eastern cuisine. This type of cuisine is still a huge blind spot in my food knowledge so I was very hopeful that Sumac could show me the way. 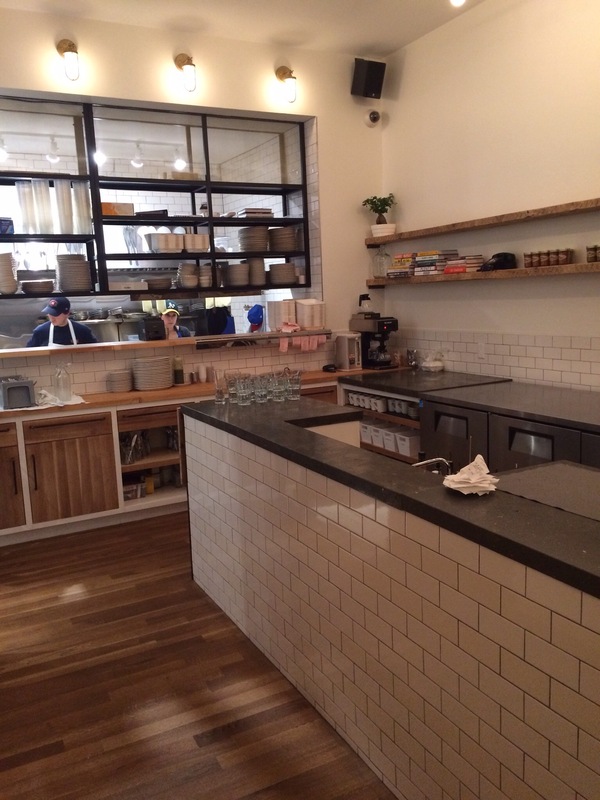 Located on the main strip of Notre Dame just west of the Atwater Market, Sumac has a very clean and sharp look. 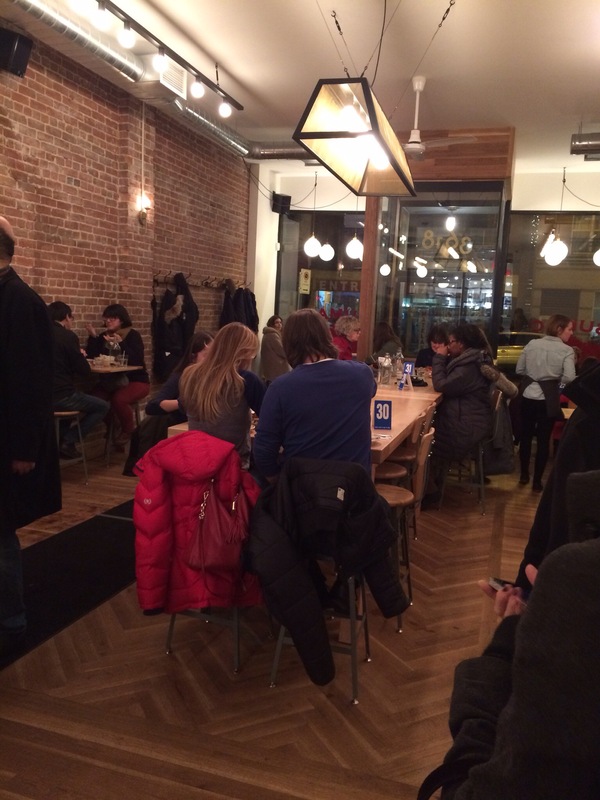 They beautifully utilize the brick wall of the old building and compliment it with pure white walls, light hardwood floors and solid wood tables. The ample lighting create a very bright space that creates a warm feel. They also add some nice music in the background to make the space feel comfortable. They have a slight different ordering procedure where you order at the counter and then serve you at your table using number cards. 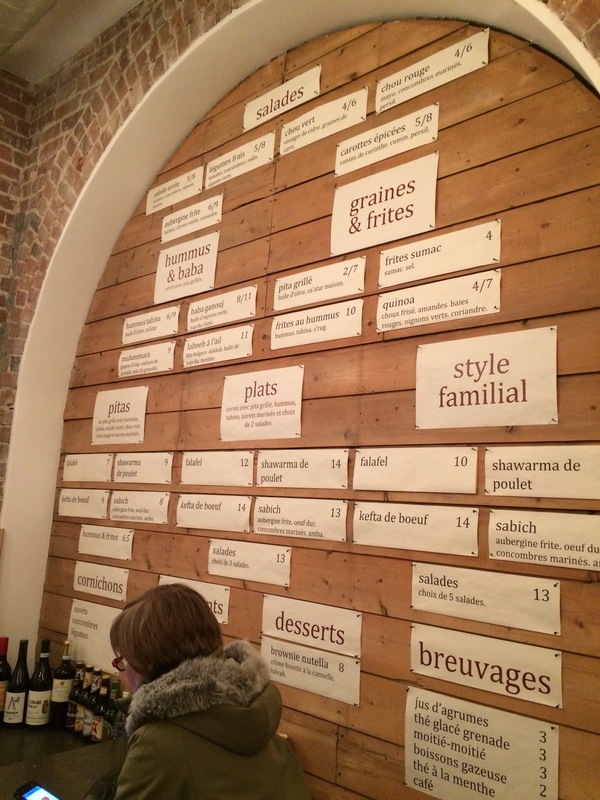 The issue, in the two times I have been, was that because the menu is only on the wall right by the cash, people take a little too long to order as they figure what to order. As such, the lineup at the counter gets long and takes longer than it probably should. The line spills into the seating space which isn’t great either for the patrons seating down. Also, there isn’t really a good spot for takeout people to wait either. Note that I went on two Friday nights so probably the peak period for this problem. I imagine it is much better the rest of the time – not a big deal, simply a minor observation. The menu is one befitting a falafel shop – falafels, chicken shawarma, beef kefta with a assortment of salads, grains, fries, hummus and baba. 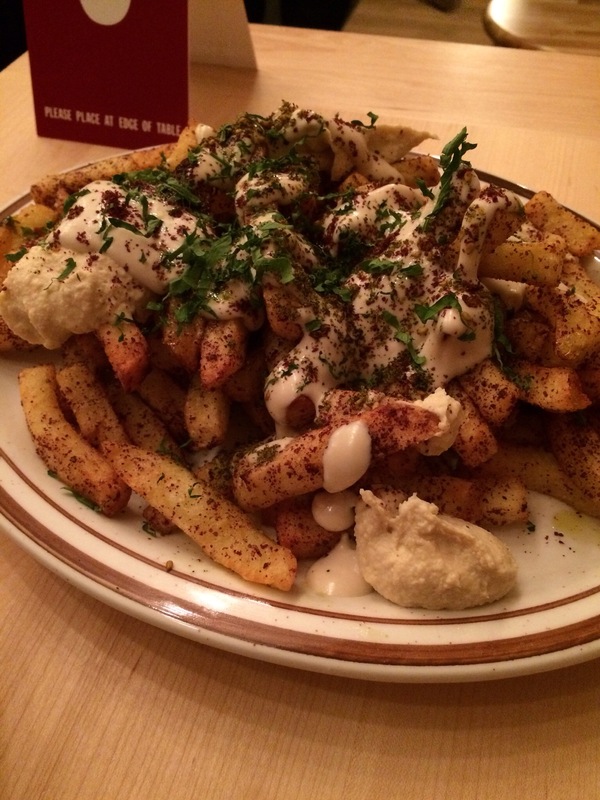 On my first visit, I decided to start with the hummus fries with hummus, tahini and s’rug. 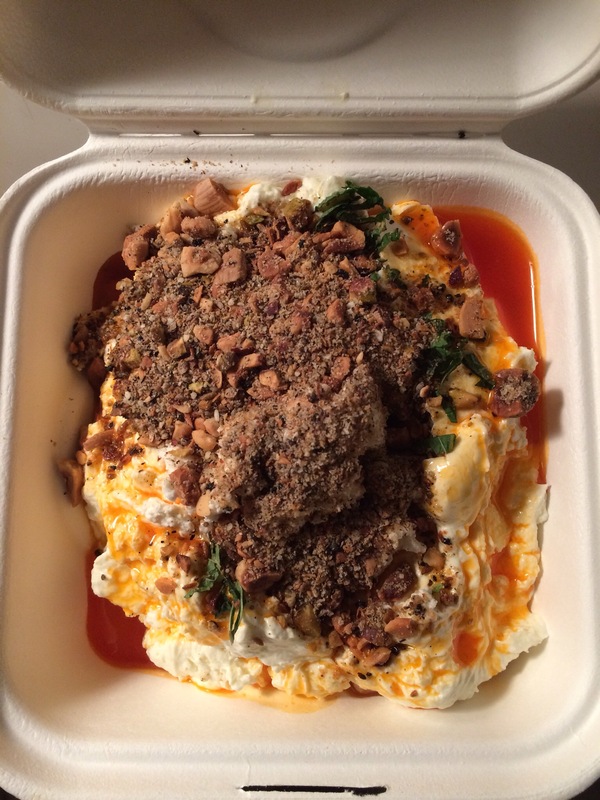 This dish was one of the first things I saw online from Sumac and peaked my interest tremendously. Just wonderful all around – the fries were nicely crispy on the outside and fluffy inside. The combination of the creamy tahini, the spice of the s’rug and the rich hummus worked exceptionally well – I had no knowledge of s’rug prior to this and my limited time with tahini never made me think of this combination. Great starter and a huge portion as well. A must-have for sure! Given the size of the fries, I decided to go with a chicken shawarma pita to finish off the meal. When you order a pita at Sumac, it is grilled and filled with hummus, tahina, chopped salad, white & purple cabbage and pickled turnip on top of your meal of choice. First off, the pita bread at Sumac is insanely good. Borderland obscene. Wherever they get them, I need to find out because they have put every other pita bread I’ve tried to shame. Thick but yet soft and chewy, the pita bread provided a great vessel for the rest of the ingredients. The chicken was nice and juicy and the vegetables fresh and crisp. 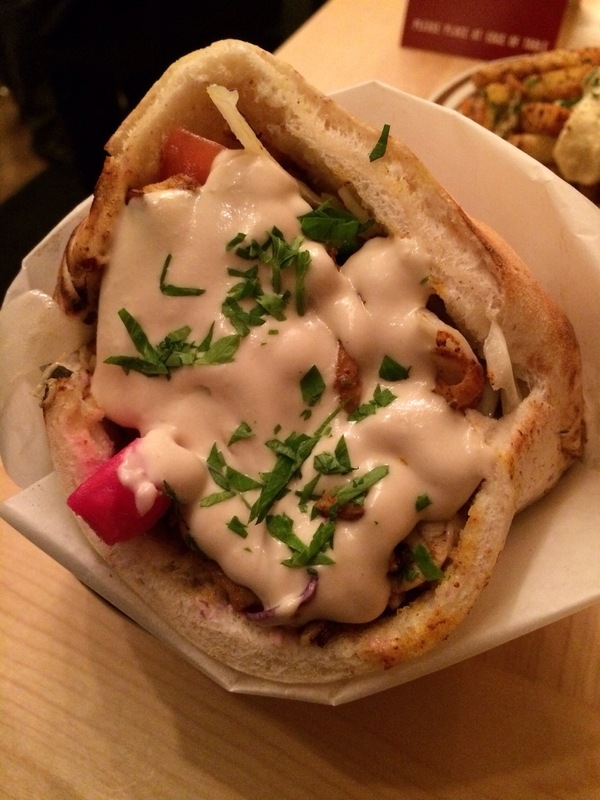 An excellent pita all around. I was so enthused by my first visit that I decided to return two weeks later for a quick takeout. In this instance, I broke my own rule and didn’t order the fries in order to try some more of the menu. First, I went with the garlic labneh served with bulgarian feta, dukkah, paprika oil, mint and a side of grilled pita bread. A wonderful appetizer that needed a lot more bread than I got! I loved how the labneh and feta mixed together – combining the saltiness and firmer texture of the feta with the yogourt-like creaminess and sour taste of the labneh. The nutty mixture of the dukkah with the fresh mint and spicy paprika oil helped to ease up the heavy richness of the dish. Very nice all around and made for a great snack using the leftovers. My main course this second time was the falafel plat served with pita, hummus, tahini, pickled turnip and my choice of two salads. I went with the fried eggplant (with harissa, preserved lemon and coriander) and the Moroccan carrots with currants, cumin and parsley. Enjoyed the carrots although they weren’t as spicy as I expected. As for the eggplant, it was okay – something didn’t grab me and frankly I’m not sure what. As for the falafels themselves, loved them. Great crunch to the exterior but they still kept a nice moistness inside. Nice depth of flavour as well. 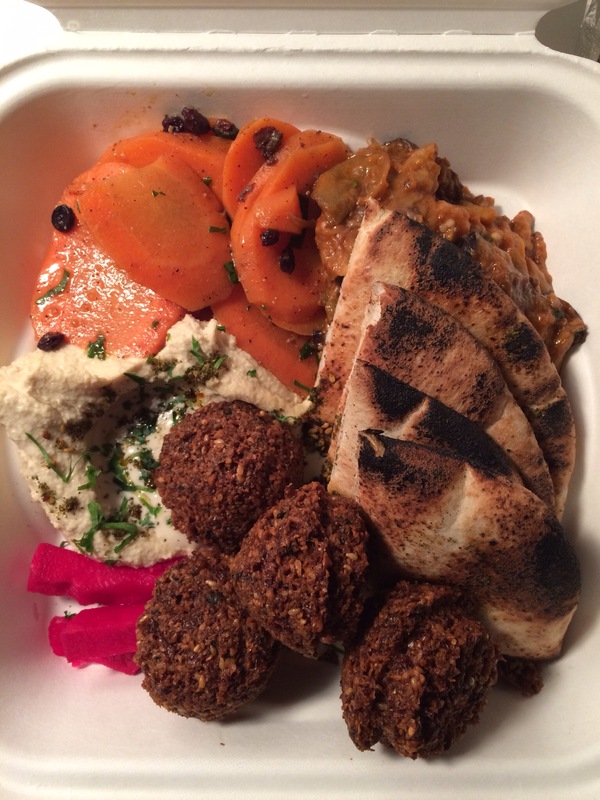 Sumac provided me with a wonderful trip into Middle Eastern cuisine which was my hope. My initial visit got me interested enough to head back to try more and my second visit did more of the same. I may lack knowledge in this cuisine but I know enough about great cuisine to know that Sumac does it very well. 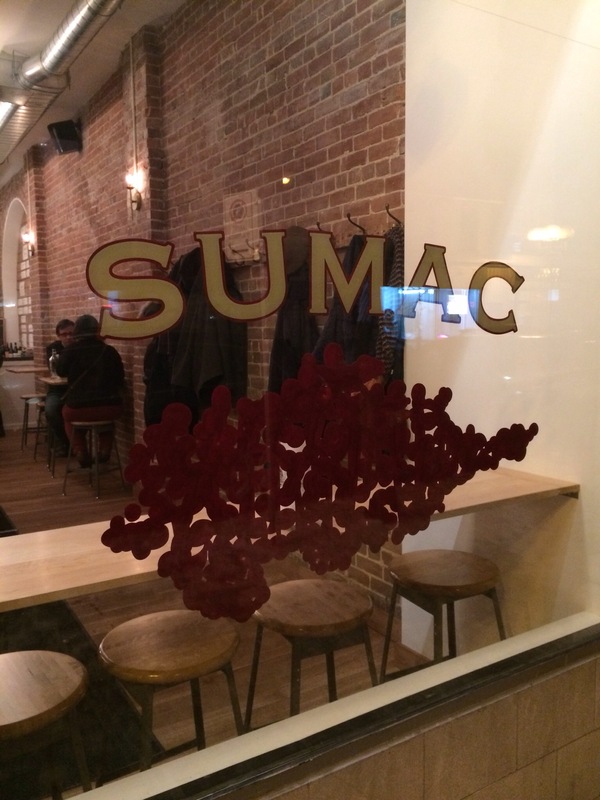 For a quick lunch or a relaxed dinner, Sumac is a perfect option. Some of you may be scared away simply by the type of cuisine but believe me, you would be doing yourselves a grave disservice to ignore the wonderful food coming out of this little shop in St-Henri. 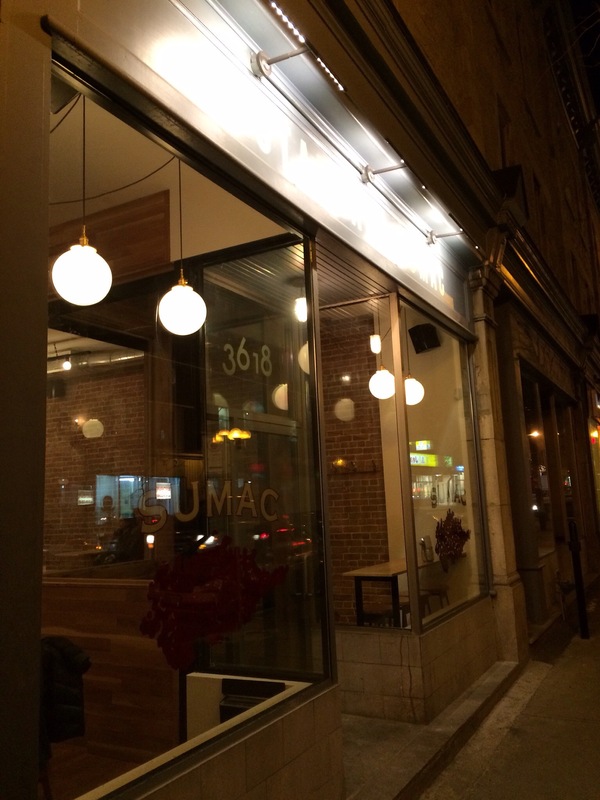 Luckily for you, you should have time on your side if you change your mind – I suspect Sumac will be a staple in the neighbourhood for some time.